Annie Weishaar leads students in a workout using exercise balls in an evening barre class in the multi-purpose room in Hillel, Monday, Dec. 3. Brogan Gerhart/Mitzpeh. 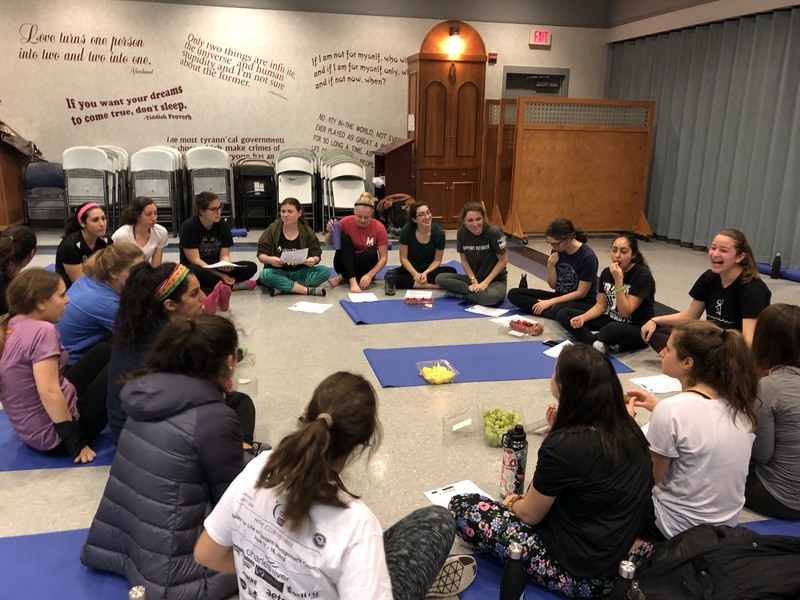 To celebrate the message behind Rosh Chodesh, female students at Hillel participated in a barre class and discussion Monday evening to celebrate the feminine body and spirit. Annie Weishaar, an instructor from OpenBarre Studios in College Park, led 21 women in a warm-up and stretching session. Several calf raises and lunges later, Weishaar incorporated exercise balls into the movements to work the whole lower body. Barre workouts incorporate ballet, yoga and pilates, according to Weishaar. And that’s exactly what the women did. After working out their legs, they transitioned into working their arms and abs. According to Mayan Beroukhim, a junior family science major, she didn’t need any weights to feel the burn. Weishaar concluded the class with yoga. Participants relaxed their bodies in Child’s Pose and transitioned into a short meditation. 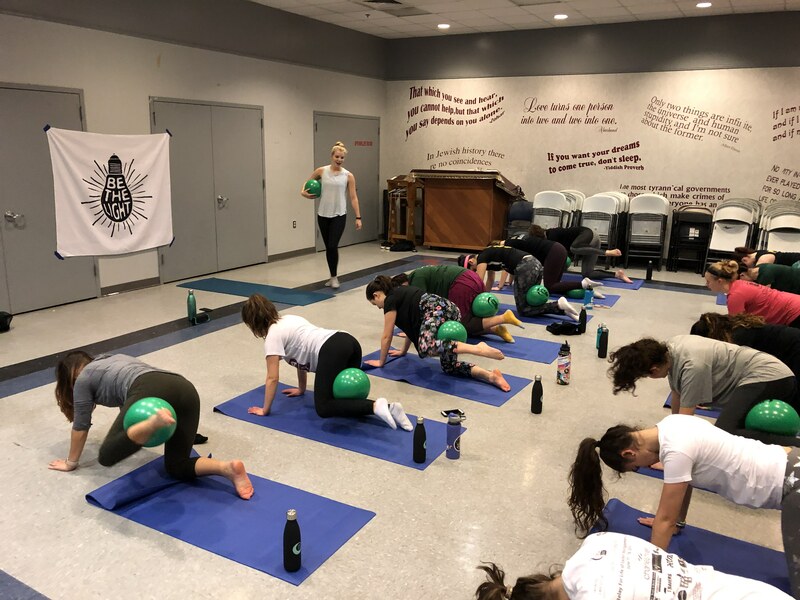 After the class, the women received complimentary yoga mats, snacks and water bottles to promote a healthy lifestyle after class and throughout finals week. A discussion followed the workout. The start of each Hebrew month, or Rosh Chodesh, holds special meaning for Jewish women. In the Torah, women refused to give their belongings to the golden calf. God rewarded their refusal with a greater sense of renewal during Rosh Chodesh. This spiritual power was the essence of the evening at Hillel. Maryland Hillel teamed up with the Nachshon Project, a fellowship that helps Jewish students study abroad, to celebrate Rosh Chodesh, even though the event date didn’t quite match up with the day it’s observed. Nachshon Project fellow Pamela Kekst, brought the event to life. Kekst, a senior psychology major, got involved with the Nachshon Project through a study abroad fellowship that gave her a budget to plan and run the evening’s event. Pamela Kekst leads students in a discussion about safe, feminist Jewish spaces and the importance of female empowerment in society, Monday, Dec. 3. Brogan Gerhart/Mitzpeh. During the discussion, the women addressed society’s distorted image of beauty and the spiritual value of exercise. Kekst also led the group in a conversation about exercise as a way to grow into your body, rather than shrink it down. Kekst, who graduates in December, feels like she has successfully left something behind for the Jewish community. No Replies to "Hillel hosts barre class to promote physical, spiritual health for Jewish women"